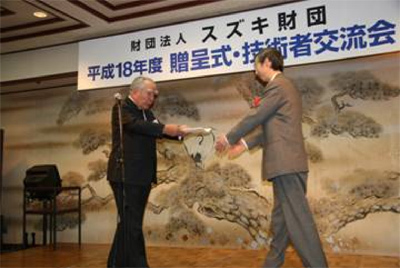 On February 16, 2007, the Suzuki Foundation (Chairman: Osamu Suzuki) decided to promote 27 cases of scientific technology research, total of 33.7 million yen for the year 2006. Suzuki Motor Corporation established this foundation in March 1980 by entrusting the fund as a commemoration enterprise for the 60th anniversary of its establishment, and it becomes the 27th research promotion. Aims: The Suzuki Foundation aims to contribute to the comprehensive development of the Japanese machine industry and to the heightening of the national welfare, by promoting scientific research related to production, use and consumption of machinery, that contributes to the improvement of convenience in people’s living, and by diffusing the fruits of such research and training to the general public.